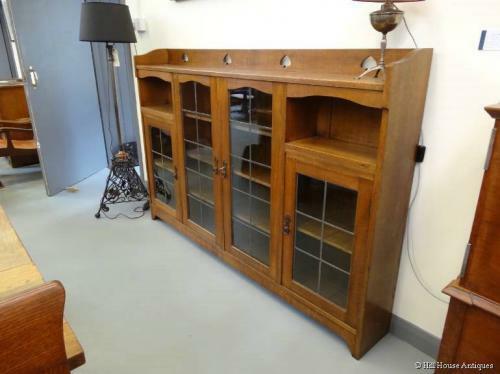 Superb Liberty & Co oak Arts & Crafts wide leaded glazed bookcase, with typical stylised heart/spade metal handles and heart shaped cut-outs to top gallery. CFA Voysey style undulating top shaped central doors and recesses; c1900. in our opinion this version was their " top of the range". Approx 72" wide, 48" high and 10" deep.